Can we have a horse drawn hearse? Yes, it’s a traditional way of taking a coffin to a funeral service. Horses come in pairs or a team of four. You can decide between black and white (grey) horses or a combination of the two. The horses can wear any colour plumes (feather headdress). Black or white horse drawn hearses can be chosen. They travel more slowly than motorised hearses (around 7 miles an hour) and we wouldn’t recommend much more than a 7 mile trip from home to place of service, for family’s comfort. 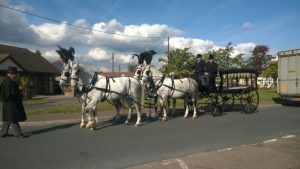 The horses travel in a horse box from their Essex farm to our funeral homes, then they return to their stables transported again by horse box after. We give your family a new horse shoe memento on the day. Can we release white doves at a funeral service? 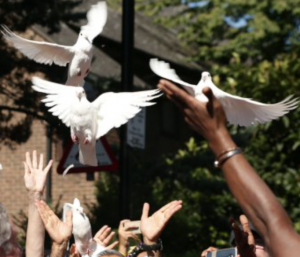 One or more doves can be released outside after a funeral service. They can be freed by hand or from a cage (cages are easier for children to handle), and they then fly back to their beautiful home in the Essex countryside. A little feather in a bag is given as a memento after the service. Can a bagpiper play on the funeral day? Bagpipers appreciate nothing more than being asked to play beautiful traditional Scottish laments leading a hearse and limousines to a funeral service. 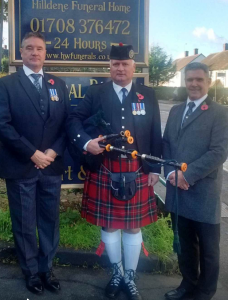 Your family does not have to be Scottish to have one of these specialist musicians grace a funeral with their presence. We regularly arrange many other types of musicians on behalf of families who wish to add extra touches to a ceremony. Please don’t hesitate to ask us to help you.